A steady old evening at Newark. Luckily for me Joe and Christine take pity on those of a nomadic life style and invited me over to the farm for a meal. One decent meal, regularly, every six months is becoming the norm. Well stuffed by the end of it. Yet again the world is put to rights and again it is proved that it is not us but the others that are making a mess of everything. I left Newark fairly early the next morning. A really nice day with the sun out for the trip up to Hazelford. 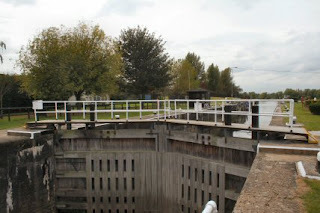 It is not far to the Town Lock and as this is manned I am soon through and on my way. My memory of the last trip did not include the amount of water that comes down the Trent and as soon as I was out in the flow the speed of the boat dropped considerably. I was thinking of calling in at Farndon Marina to pick up some diesel and with the extra power needed to get anywhere it became a must. It took an age to get there and I pulled into the self-service pump. There is a chandlery shop here so I wandered in to get a connection to attach to the sink outlet. Having found exactly the item I wanted and paid for it I asked about fuel. Sorry not till the delivery tomorrow. Ah well I have enough to get me back. I hope. I got prepared to leave, cup of tea at the ready, and went astern to pull back out into the Trent. Almost straight away there was a bang and the prop stopped turning. Bugger. It was the shaft coming loose again. Soon fixed and this time I went into the marina to turn around so that the astern wasn’t so important in the escape onto the Trent. With the engine going somewhat faster than usual I plodded on up past Fiskerton and after what seemed like a positive age arrived at Hazelford Lock. It had taken me five hours to get here and the majority of those were in travel. 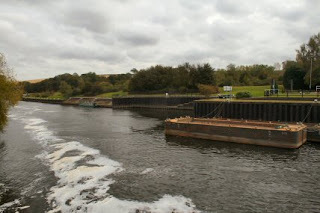 Hazelford Lock is an island with a weir on both sides. Although the book says that there are some facilities here it is a mistake and no sluice as the loo has a soak-away that won’t cope with extra use. Abigail Jenna looks very small against the massive moorings that are here. These were of a standard that was needed by the commercial traffic. If you are into blackberry jam then this is the place to stop for a while. All over the island are walks cut through the briars and every one is dripping with berries. 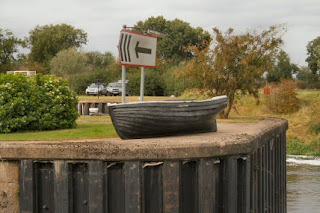 On the right of the lock gate is an old row boat that had been used for many years as the means by which the lock-keepers had got to work before the erection of the footbridge.